Designed with patented Spring-Action Rocking Technology, the GCI Outdoor FirePit Rocker camp chair delivers a smooth rocking action while you enjoy your favorite outdoor activity. The FirePit Rocker features padded arm rests, built-in beverage holder and a convenient carry handle. 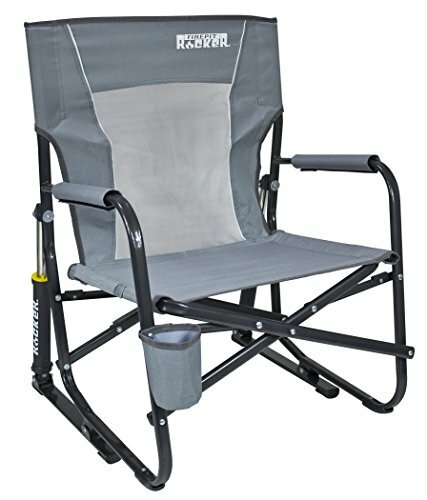 Folding a camp chair open and closed has never been easier or safer with GCI Outdoor’s patented EAZY-FOLD Technology. The FirePit Rocker is constructed of lightweight and sturdy powder-coated steel that supports up to 250 pounds. Each chair weighs 12.1 pounds. Measures 24 x 25 x 34.8 inches when open and 25 x 4.9 x 34.8 inches when folded. The GCI FirePit Rocker folding camp chair is ideal for any outdoor activity such as camping, tailgating, fishing and watching sports. Limited lifetime warranty. If you have any questions about this product by GCI Outdoor, contact us by completing and submitting the form below. If you are looking for a specif part number, please include it with your message.